Academic excellence. Affordability and access. Fiscal discipline. These remain critical elements of the University of Michigan Ann Arbor’s budget recommendation for the coming year. The 2017 Fiscal Year General Fund budget recommendation, presented here, is designed to leverage a modest increase in the state appropriation and the university’s continuing cost-containment efforts to enhance the university’s overall academic excellence, while emphasizing student access and affordability. 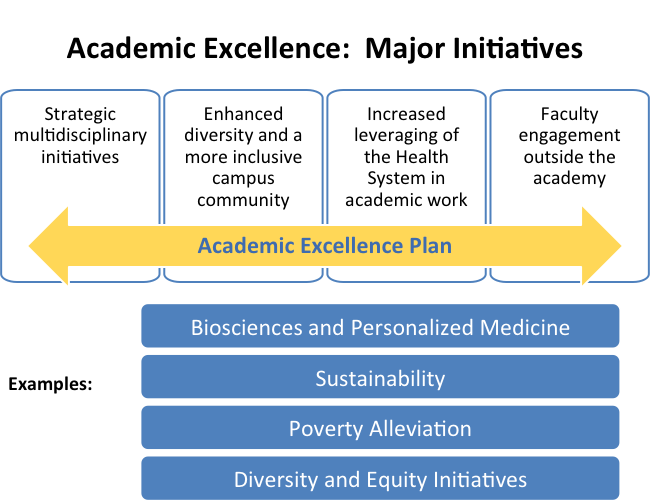 Additional priorities reflected in the FY2017 budget recommendation include prioritizing interdisciplinary initiatives that draw on the unique strengths of the University of Michigan to serve the public good by attacking complex issues; providing additional resources to enhance diversity, equity and inclusion efforts; and adding resources to meet the growing needs for essential student services. We believe we are able to accomplish all of this with a modest tuition increase, the impact of which is mitigated for students with financial need by continued investment in financial aid. The FY2017 budget recommendation includes resources for major initiatives that further enhance the university’s academic excellence by focusing on areas where the university’s breadth of excellence can be better leveraged. This includes innovative, socially relevant multidisciplinary initiatives; diversity, equity and inclusion; additional leveraging of the biological sciences health system resources in academic efforts; and increasingly encouraging and supporting public engagement of the faculty. Innovative and socially relevant interdisciplinary work: A major focus in the coming year and beyond will be to position the university for perpetual excellence and public impact in research, creative work, performance, health care and education. Building on the university’s vast breadth of academic excellence, one key to this work will be research and educational programs that cut across academic disciplines. We aim to position this university to exemplify what a major public research university should be: A place that discovers new knowledge, helps solve problems across the sciences, engineering, humanities and the professions, and engages students at all levels in these important activities. The University of Michigan has more than 100 graduate programs ranked near the top in their fields, perfectly situating it for this type of work. After all, problems don’t know what discipline they are supposed to fall under; they are just problems waiting for solutions. By bringing these university resources to bear on the biggest challenges and opportunities confronting society, we have the opportunity to truly become more than the sum of our many excellent parts. One of these areas of focus will be poverty alleviation. We will develop and rigorously test both new and existing approaches to preventing and alleviating poverty, focusing on increased educational and economic opportunities and improved healthcare. We know that to prevent and alleviate poverty, we must incorporate knowledge from multiple disciplines, and we are fortunate to have world-class scholars in many relevant areas of expertise and a campus that offers a richly collaborative, multidisciplinary environment. We also enroll students who are eager to better the world around them and who wish to emerge from the university with the skills and knowledge to be leaders in positive change. We have community partners who turn to the university for its expertise in scholarship, policy and practice. This confluence of resources ensures that our multidisciplinary efforts to prevent and alleviate poverty will have impacts that are far reaching. Sustainability is another area of focus. We seek to strengthen the university’s position by providing interdisciplinary education that addresses sustainability challenges at the intersection of environment and society. This approach will be used throughout sustainability research, teaching and civic engagement. A new structure will be implemented for our academic programs in the environment and sustainability to leverage the broad spectrum of expertise across campus. Diversity, equity and inclusion: Over the past year, the university community has been engaged in a quest to develop a comprehensive strategic plan with the goal of becoming a more diverse, equitable and inclusive community. The entire campus community has undertaken a bottom-up planning process that includes more than 50 campus units in all. Those units, including all 19 schools and colleges, have developed and submitted plans outlining their diversity, equity and inclusion goals for the upcoming year and beyond. This budget recommendation includes funding to support the strategic diversity, equity and inclusion plan across the Ann Arbor campus. Details of the plan will be announced this fall and will touch virtually every aspect of the university, and include all components of the community: faculty, staff and students. Additional resources are included in the budget plans for the individual schools and colleges and other campus units. These dedicated resources will be used in a variety of ways that are still taking shape. Examples of programs that already are underway and that will be supported include the HAIL Scholarship program, which targets high-achieving, low-income students in Michigan high schools with an offer of a full-tuition scholarship for four years; the Wolverine Pathways program, an after-school and weekend program of supplemental educational opportunities for students in Southfield and Ypsilanti, with an opportunity to earn a four-year, full-tuition scholarship; and professional development experiences for faculty members to enable them to more effectively address the challenges of teaching in multicultural classrooms. Biosciences integration: We are in an era of unprecedented discovery potential in the biological and biomedical sciences. Life science has become a fundamental target of discovery in many fields once distant from biology. The integration of these disciplinary approaches is advancing our understanding of human health and disease. Taking a multidisciplinary approach will be key to solving many of life science’s most important puzzles, enabling us both to solve problems that have never come up before and to address old problems in new ways. The university is positioned well in this highly collaborative and multidisciplinary research landscape because of our breadth of academic excellence. We have world-class schools of Medicine, Dentistry, Pharmacy, Engineering, Natural Resources and Environment, Public Health and Nursing, outstanding natural and physical science departments within the College of Literature, Science, and the Arts, along with our free-standing Life Sciences Institute and Institute for Social Research. To even further integrate the biological sciences across the institution, last fall the university approved a reorganization that brought together the roles of the executive vice president for medical affairs and the dean of the Medical School. By linking responsibility for the health system’s tripartite mission of research, education and patient care in a single leader, we enable a seamless connection among the people and resources of the Medical School and the hospitals and health centers, while creating a transparent structure for timely action and accountability. Continued funding for this effort will allow the university to develop coordinated hiring plans that span various schools and colleges, supporting the recruitment of world-leading bioscientists and position them to conduct breakthrough research on our campus. Faculty engagement: As a major public research institution, U-M has an obligation to benefit the public by continually finding ways to leverage its teaching, research and discovery for the public good. The year ahead is an important time for the university to stimulate scholarship that is focused outward and to increasingly enable members of the faculty to engage the public in their work. Faculty members are actively engaged in a number of projects related to the Flint water crisis. Others are helping to shape the future of public discourse on important topics or helping to shape what citizen engagement looks like in local communities. Still others are facilitating public discussion on important topics through sharing their research, offering their expertise and serving on federal, state or local commissions. The overarching goal is to disseminate and advance community-based research and scholarship that address social and policy challenges. We are investing in classroom facilities that support curricular innovation and promote student collaboration and team-based learning. Courses designed for team-based learning cannot be taught effectively in older, traditional classrooms. They require more open, physical space with flexible furniture, sufficient power and wifi infrastructure and increased technology. This budget proposal includes funding to update and equip more than 30 small- to mid-sized classrooms with this new approach in mind. Digital education has the potential to shape the future of learning and to redefine public residential education at a 21st century research university. Faculty members already are engaged in developing an array of innovative tools that unlock new opportunities and enabling personalized, engaged and lifelong learning. One example is GradeCraft, a game-inspired learning management tool that enables the personalization of coursework to accommodate various learning styles and interests. In video gaming, a player improves by failing. Similar to gaming, the GradeCraft tool allows students to take risks and to treat unsuccessful assignments not as failures but as learning experiences that pull students closer to mastery. GradeCraft has been used by more than 2,000 students across 40 different courses so far. Its use will be expanded in the coming year. GradeCraft is but one example of the technologies whose development, testing and deployment is supported in this budget. The University of Michigan is recognized nationally as a leader in support for students with disabilities, in sexual assault prevention programs and in providing mental health services for students. This budget recommendation includes additional resources to enhance effort in these areas and others. The demand for student mental health services is growing on our campus as it is across the nation. We already have added staff to Counseling and Psychological Services and created a program of “embedded” counselors who are located within schools and colleges across campus. This budget recommendation provides for additional mental health support, to help meet the still-growing need on our campus. Enhanced sexual assault prevention education also is provided for in this budget recommendation. Additional staffing in this area will allow the university to expand prevention training now offered to all undergraduate students to include all graduate and international students. Additional staffing also will improve services to both sexual misconduct claimants and respondents and provide more effective case management through the sexual misconduct investigative and sanctioning process. Just last month U-M was ranked as the best disability friendly college or university in the nation, yet we are strengthening our commitment to student success. This budget recommendation provides additional funding to support additional staff for Services for Students with Disabilities and improve the facilities for students who require testing accommodations. Access and affordability: Financial aid One of the key aspects of the General Fund budget recommendation is an ongoing emphasis on keeping the university accessible to all students through a comprehensive program of financial aid. For many families, the published cost of attendance is not the price that they will be expected to pay. About 70 percent of in-state students and 50 percent of out-of-state students receive some form of financial aid. Indeed, for many years we have emphasized financial aid in our budget, so that the net cost – the cost not just of tuition, but also room and board, books and supplies – has not grown in seven years for most students with financial need. In fact, factoring in inflation, the cost to attend the University of Michigan has actually declined over this period for students with need. We have done this by replacing loan dollars – money that students must eventually repay – with grant dollars, which are not repaid, and as a result, student debt burden at graduation has been decreasing. This budget recommendation continues our commitment to provide all in-state students with a financial aid package that meets 100 percent of their demonstrated financial need, through a package of grants, loans, and work-study jobs. Due to budget constraints, we are unable to make that same commitment to out-of-state students. However, with approval of this budget we will be able to meet full demonstrated financial need for out-of-state students from families with incomes of up to about $90,000 a year. 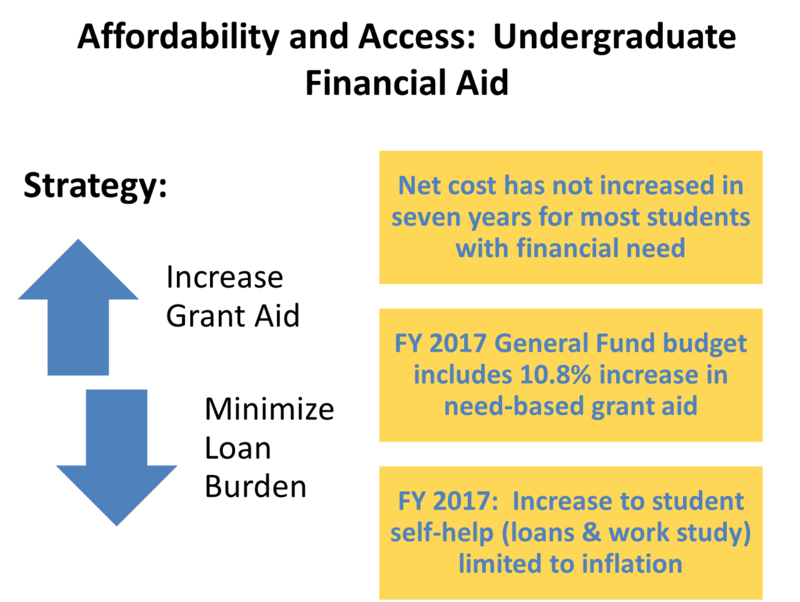 This budget recommendation provides funding for increased need-based grant aid in order to minimize the cost increase for students with financial need. Additional grant aid will be provided to students with financial need to help offset the increased cost of attendance. For example, student self-help (loans and work-study jobs) will increase by $114 per year for eligible in-state students paying the most common lower division undergraduate rates. 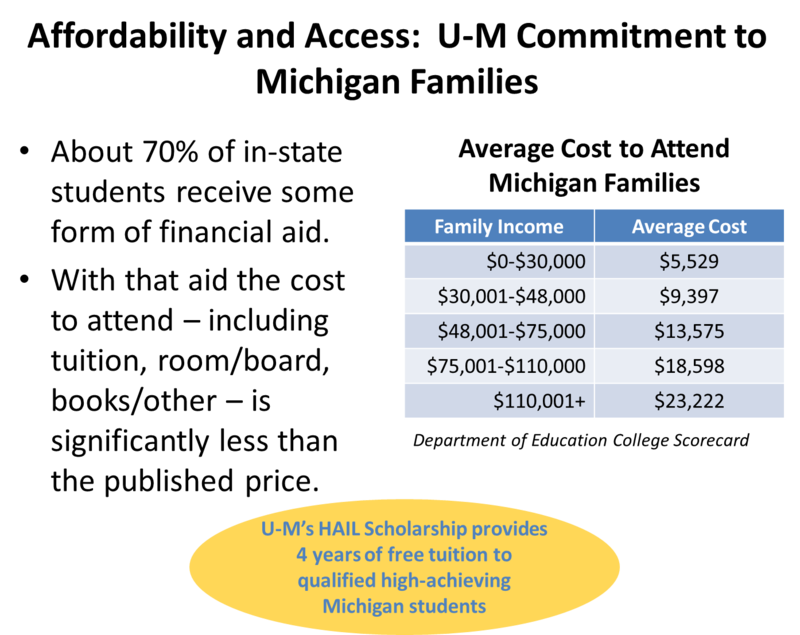 A University of Michigan education is a great value as evidenced by the U.S. Department of Education’s College Scorecard. The average annual cost of attendance is less than the national average, while the university’s six-year graduation rate is among the highest in the nation and well above the national average. The median salary of U-M graduates at 10 years after entering college also is higher than the national average. 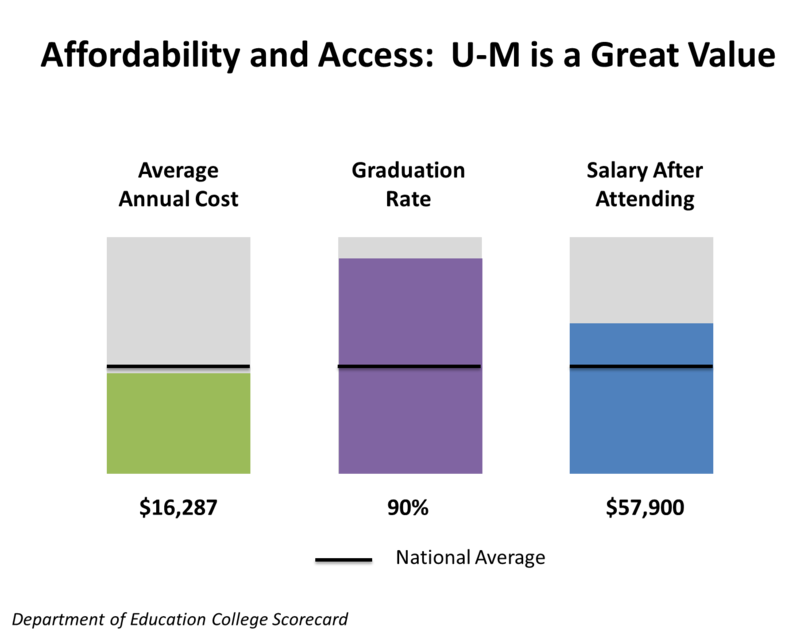 Controlling costs and reallocating savings to higher priorities remains an essential piece of the budgeting process. Since FY2004, we have reduced or avoided recurring General Fund expenditures totaling $337 million. By remaining relentlessly focused on strategic cost containment, the university has been able to avoid program cuts and still keep tuition increases modest throughout one of the most difficult economic periods for the state of Michigan and into a period of recovery. The FY2017 budget recommendation contains an additional $23 million in reductions and reallocations. Individual efforts range in size and scope from a Medical School pilot to outsource the sterilization of instruments with savings of $300,000 to the College of LSA saving $390,000 by consolidating open administrative positions within departments. Where units have made cuts to academic programs, they have studied enrollment patterns prior to reducing or eliminating undersubscribed programs and courses with low student demand. The College of Engineering and the Stephen M. Ross School of Business are, for example, phasing out the joint master’s program in entrepreneurship and the School of Nursing has begun to offer certain graduate courses less frequently. Philanthropic giving also is critically important, as it provides an alternative revenue source for some needs, allowing the flexibility to shift costs off the General Fund. For example, the School of Public Health was able to fund the $80,000 cost for its Global Health Internship program with donor gifts, and the College of LSA will cover another $3.9 million of student financial aid through donor support. The 2017 Fiscal Year General Fund budget recommendation is built upon a commitment to maintain and enhance the academic excellence of the university and provide wide access for students to the broad array of educational opportunities on the Ann Arbor campus. It is a budget recommendation that reallocates financial resources and again stresses efficiency and cost containment to make good on that commitment. It invests in new strategic, highly collaborative initiatives as well as programs that enhance the campus climate for students, faculty and staff from all backgrounds. It provides for continued investments in teaching innovations, it ensures that we fully satisfy compliance requirements and it provides the resources necessary to offer modest salary increases for faculty and staff. It fulfills the university’s commitment to access and affordability with a 10.8 percent increase in undergraduate financial aid. And it extends the university’s more than decade-long commitment to fiscal discipline by trimming an additional $23 million in recurring expenses from the General Fund through a continued focus on operational efficiency and seeking alternative sources of revenue. Once implemented, this $23 million in reductions will mean that since 2004, $360 million in recurring expenses will have been trimmed from the General Fund budget, allowing resources to be reallocated to higher priorities and constraining tuition increases. Revenue to the General Fund comes from three main sources: tuition, state appropriation and indirect cost recovery on sponsored research. Indirect cost recovery pays specifically for the indirect costs of research, making this funding not available for allocation on a discretionary basis. The revenue to pay for budget priorities for FY2017 would come mainly from increases in revenue associated with tuition and fees and an increase in the state appropriation, complemented with resources made available through cost cutting and reallocated expenditures (see Table 1). Year-over-year change in tuition revenue is a function of freshman class size, the proposed tuition rate increases and an incremental projected increase in the proportion of out-of-state students.